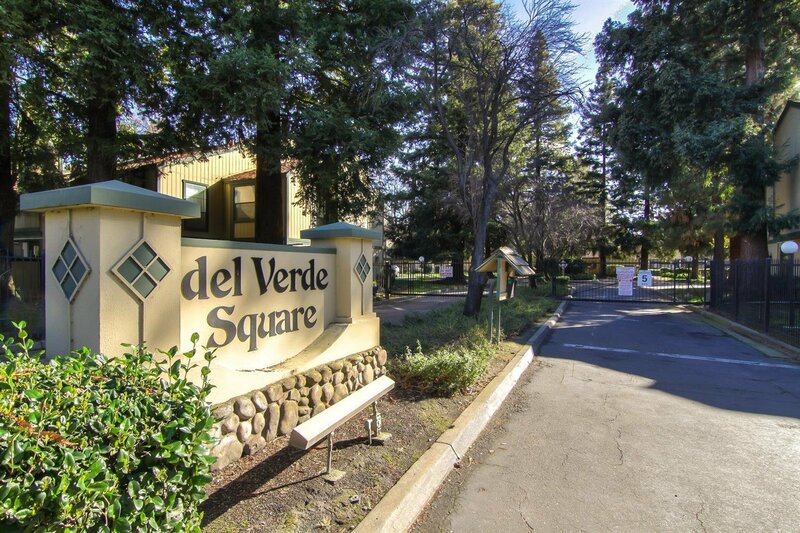 Welcome home to Del Verde Square, a GATED COMMUNITY with easy I-80 and I-5 access, lovely mature landscaping, and majestic Redwoods. Sought-after TWO BEDROOM floor plan with vaulted ceilings, fresh interior paint and new light fixtures. This STYLISH upper unit overlooks a large, lovely lawn/play area...it does not face the parking lot! NEW carpet and vinyl flooring...ALL NEW kitchen counters, stainless steel sink, stove, dishwasher, garbage disposal and water heater...many cabinets, freshly painted! NEW bathroom vanity and toilet. HVAC is only 4 years old! Stainless steel fridge, and NEW washer & dryer are INCLUDED for the lucky buyer! Located VERY near the pool, spa and clubhouse! LOTS of GUEST PARKING on site. AMAZING LOCATION just MINUTES to downtown Sacramento and the International Airport, and there's even a bus stop right out in front. NEAR lots of SHOPPING...Bel Air, Walmart, Home Depot, Save Mart and more. Walk less than a block to the BRAND NEW Oakbrook City Park! Listing courtesy of Coldwell Banker Residential Brokerage. Selling Office: eXp Realty of California Inc..